This kit comes with the Gallagher B60 energiser - which Gallagher claim is the best selling energiser across the globe! The B60 energiser comes with a 7 year guarantee and can power up to 6km of multi-wire fencing, or up to 2 km with light vegetation. 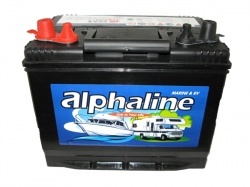 The B60 runs off a 12 volt leisure battery (not included). 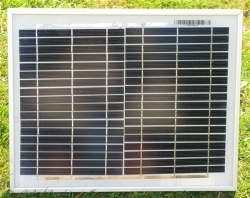 It has lights to indicate that the energiser is working and to warn you if the battery is low. 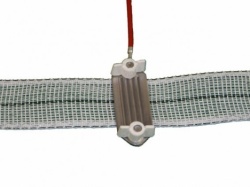 It is small and easy to mount and excellent for customers who require simplicity and quality. 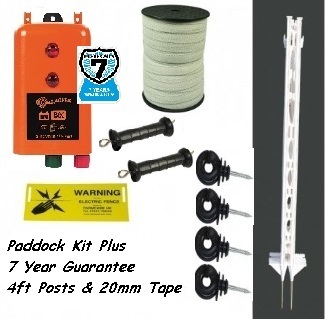 This kits gives you everything you need for a 100m paddock with 2 lines of tape. The only item you'd need to add is a 12 volt leisure battery. If your paddock is larger, you have the option of adding more tape. If you'd like to upgrade to superior electric tape or to rope, please give us a call and we'll be happy to create a kit with the appropriate kit reduction. A 3ft version of this kit is also available for those with ponies or smaller horses. We say: The Gallagher 7 year guarantee is new this year (please remember to register it with Gallagher when you get your energiser). This makes the investment really worthwhile and this is definitely a kit that should be considered!